National Geographic Kids. Washington, DC: National Geographic Society, August 2010. Print. National Geographic Kids. Washington, DC: National Geographic Society, June/July 2010. Print. National Geographic Kids. Washington, DC: National Geographic Society, May 2010. Print. National Geographic Kids. Washington, DC: National Geographic Society, December 2009. Print. In publication since 1975. Previously National Geographic World. 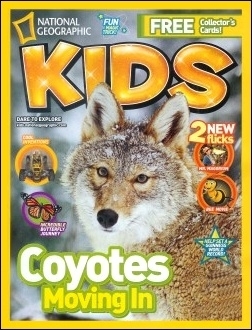 Like it’s parent magazine, National Geographic Kids is a delightful hodgepodge of culture, science, and entertainment. The focus of the magazine is often on nature and animals, which also tends to dominate the covers. However, sports, games, movies, humor, and human interest stories help round out each issue. This children’s version is much more colorful and less sedate, than it’s namesake publication. While each issue runs at typically thirty plus pages, NG Kids has no less than ten regular features, in addition to articles unique to that issue, and each page is often a mixture of pictures, text boxes, and stylized font designed to capture the reader’s attention. While a bit busy at times, the in your face content make it a good pick for reluctant readers who find pages of unbroken prose to be a daunting prospect. Some of the content - such as the hidden pictures and photo puzzles - skews fairly young, but much of it, specifically the Weird but True, Guinness Book of World Records, and Bet You Didn’t Know, will hold great appeal for tweens, who are always eager for interesting and strange facts and trivia. The trivia in each issue is a great tool for drawing readers in. Mentioning some of the more intriguing facts to a class, or highlighting the same in a display in the library, will encourage even often reluctant readers to pick up a copy and see what else is inside.